Powerful and reliable electric winches. If you are serious about off-roading then a winch is an essential piece of kit. They are indispensable when getting yourself and others out of tricky situations. These powerful and reliable electric winches all feature - a planetary gear system for fast line speed, free spooling, power in & power out, low electric current. The range (excluding the DB2000) also feature an automatic load-holding brake, hardened drum and are supplied with a quality galvanised aircraft cable or dyneema rope. 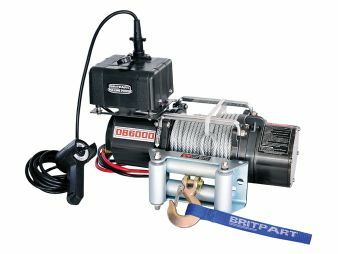 A full range of winching equipment is also available from Britpart - including; safety gear, bumpers, chocks, hooks, shackles & ropes.